Millions of online users are using Google Chrome to navigate the Internet. Google Chrome provides a light-weight browser that is convenient. Sometimes people are logged into so many social media accounts that we almost don’t think twice before clicking on various share buttons out there. In some cases people might want to do some highly secure transactions like check bank accounts, credit cards, etc. and it is always better to do it behind a secure browser feature. Note, the Browse Incognito(private) feature doesn’t guarantee anything but it ensures that websites you visit don’t track your browsing behavior by not installing cookies while you browse the web. 1) Click on the wrench button in the top-right of Chrome browser. 3) The drop down menu has a list of options. 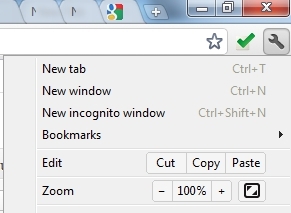 Select the New incognito window option that will launch a new window. If you have any questions relating to Chrome, leave a comment below.